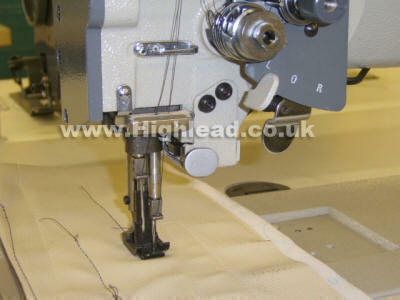 The Highlead GC20638-25D FL2 is a lockstitch twin needle long arm walking foot sewing machine which features a selectable split needle bar system; together with automatic thread trimmer and electronic control. The long sewing machine arm allows up-to 635mm* (25") clearance to the right of the needles, which is approximately 2.5 times bigger than most standard machine arms. It features a triple feeding action by way of: bottom feed, needle feed and walking foot top feed and is fitted with two large vertical axis mounted hooks & bases for use with medium to heavy weight materials. The special split needle bar system is particularly useful when sewing corners or tight angular stitching and allows the operator, at the flick of a lever, to disengage one of the needle bars; so the machine can sew with one needle. 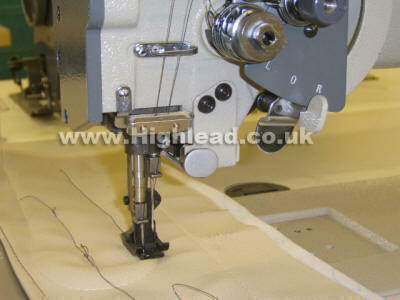 You can select to disengage or re-engage the left or right needle depending on the type of corner you are stitching. The Highlead GC20638-25-D FL2 is a feature packed machine and as well as its split need bar system, triple feeding (bottom feed, needle feed & walking foot) and automatic thread trimming, it comes as standard with programmable auto back-tack, auto reverse, knuckle quick reverse and built in stitch program module. The GC20638-25-D is a long arm, twin needle, needle feed, walking foot machine with UBT, for use on medium to heavy weight materials and is aimed at job applications where a standard arm sewing machine is not suitable.